Got three hours to kill? Or just feel like being sad for a long time? Then watch this CGI model of the Titanic sink in real time…yikes. This is our full-length animation of the Titanic sinking, beginning with the iceberg collision and ending with its disappearance. The point of collision is at 1:06 in the video. This is a complete animation; not a short animation that was slowed down to match real time. This is also highly accurate, though we have already documented improvements we plan to make for the final game. The animation includes text frequently appearing with what is happening on board the ship. This also includes visuals of various interior rooms flooding, lifeboats launching, rockets firing, and the Californian on the horizon. This animation is, however, a bit rough around the edges. Some details, like guy wires and boat falls, are not rendered, and a few other things might appear glitchy, incomplete, or animations a little bumpy. In order to release this video in time for the 2016 anniversary (April 14/15), we needed to hastily render this. It's not easy working with a nearly 3 hour video file! This Friday, we're honoring Mother Earth! On April 22nd, Earth Day is an annual world wide celebration in support of environmental protection. From their vantage points some 800 km high, Earth-observing satellites ‘see’ our planet in more ways than one. Different sensors see different aspects such as topography, temperature and atmospheric make-up. Equatorial currents swirl across the Pacific Ocean. NASA monitors Earth's vital signs from land, air and space with a fleet of satellites and ambitious airborne and ground-based observation campaigns. The International Space Station hosts a variety of payloads and experiments supporting climate research, weather predictions, hurricane monitoring, pollution tracking, disaster response and more. 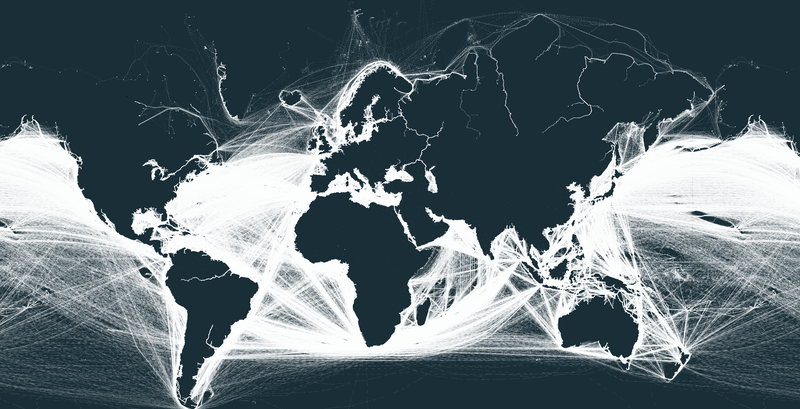 You can see movements of the global merchant fleet over the course of 2012, overlaid on a bathymetric map. You can also see a few statistics such as a counter for emitted CO2 (in thousand tonnes) and maximum freight carried by represented vessels (varying units). You can pan and zoom in the usual ways, and skip back and forward in time using the timeline at the bottom of the screen. The controls at the top right let you show and hide different map layers: port names, the background map, routes (a plot of all recorded vessel positions), and the animated ships view. There are also controls for filtering and colouring by vessel type. The merchant fleet is divided into five categories, each of which has a filter and a CO2 and freight counter for the hour shown on the clock. In some cases this is because there are ships navigating via canals or rivers that aren’t visible on the map. Generally, though, this effect is an artefact of animating a ship between two recorded positions with missing data between, especially when the positions are separated by a narrow strip of land. We may develop the map to remove this effect in the future. 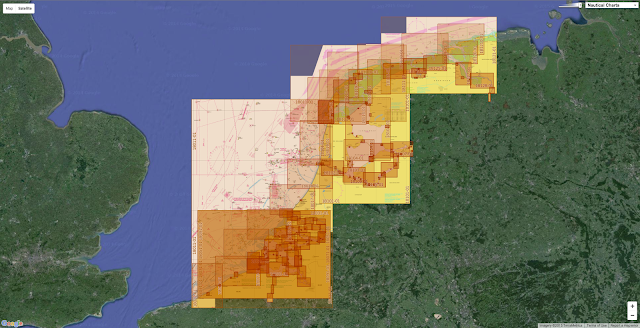 UCL EI took data showing location and speed of ships and cross-checked it with another database to get the vessel characteristics, such as engine type and hull measurements. With this information they were able to compute the CO2 emissions for each observed hour, following the approach laid out in the Third IMO Greenhouse Gas Study 2014. Kiln took the resulting dataset and visualized it with WebGL on top of a specially created base map, which shows bathymetry (ocean depth), based on the GEBCO_2014 Grid (version 20150318), as well as continents and major rivers from Natural Earth. Our data sources for shipping positions are exactEarth for AIS data (location/speed) and Clarksons Research UK World Fleet Register (static vessel information). We are very grateful to our funders, the European Climate Foundation. Almost 93% of reefs on the Great Barrier Reef have been hit by coral bleaching, according to a comprehensive survey revealing the full extent of the devastation caused by abnormally warm ocean temperatures sweeping the globe. There have only been three mass bleaching events recorded on the reef , and all of them have happened since 1998. Why do coral bleach ? Scientists say this episode is the worst they’ve ever seen. The world is in the midst of a global bleaching event, which is a result of a pulse of warm water flowing around the Pacific Ocean caused by El Niño, and the background global warming caused by man-made greenhouse gas emissions. 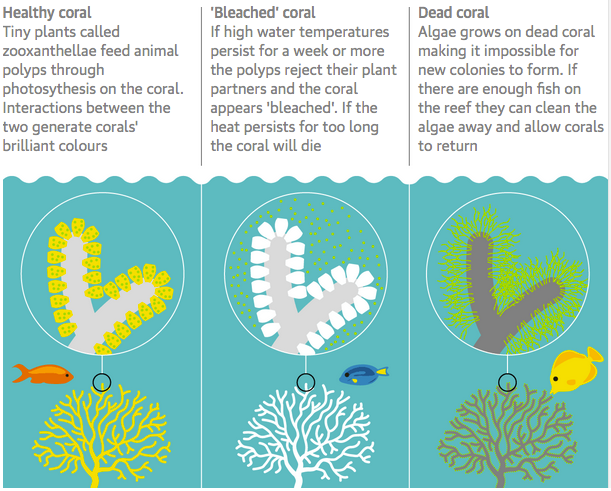 Corals bleach when they experience temperatures above their normal summer maximum for a month or two. The situation is made worse if there are few clouds, and a high level of UV radiation blasts the coral. The Great Barrier Reef aerial survey began last month, and has now covered 911 individual reefs along the 2,300km structure from helicopters and planes. Prof Terry Hughes, from James Cook University and head of the National Coral Bleaching taskforce, said only 68 of those reefs escaped bleaching entirely. As Guardian Australia reported last week, more than half the surveyed reefs have been severely bleached, with as many as 81% of reefs north of Port Douglas experiencing severe bleaching. If coral remains bleached for an extended period, it is likely to die. Hughes said that the northern region is already seeing mortality as high as 50%, and he expected that at some reefs it will exceed 90%. 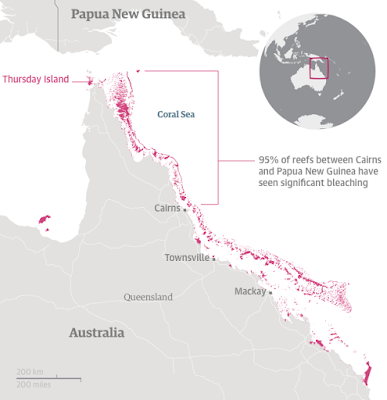 In the central section between Port Douglas and Mackay, a third of the reefs are severely bleached and 57% have seen moderate or minor bleaching. South of Mackay, 1% of reefs are severely bleached, but even there, only a quarter of the reefs have escaped bleaching entirely. Coral bleaching on the Great Barrier Reef shows up as white and yellow patches. The aerial survey has covered 911 individual reefs aong the 2,300km structure. Coral bleaching on the Great Barrier Reef shows up as white and yellow patches visible from aerial surveys. Hughes told Guardian Australia that in the previous two mass bleaching events – 1998 and 2002 – 40% of the reefs escaped bleaching. And in those two years, only 18% of reefs were severely bleached. “We’ve never seen anything like this scale of bleaching before. In the northern Great Barrier Reef, it’s like 10 cyclones have come ashore all at once,” said Hughes. Bleached coral around Heron Island on the Great Barrier Reef. Hughes says the southern part of the reef was partially saved by weather conditions that brought clouds and cooler weather. The aerial work is being confirmed by teams of divers who are examining the coral up-close. Hughes said there have been 100 people underwater for the past month, and so far they’ve collected data from about 150 reefs. Martin Frey: Is this the world's most adventurous man? "Growing up, Jacques Cousteau was my idol" he says. 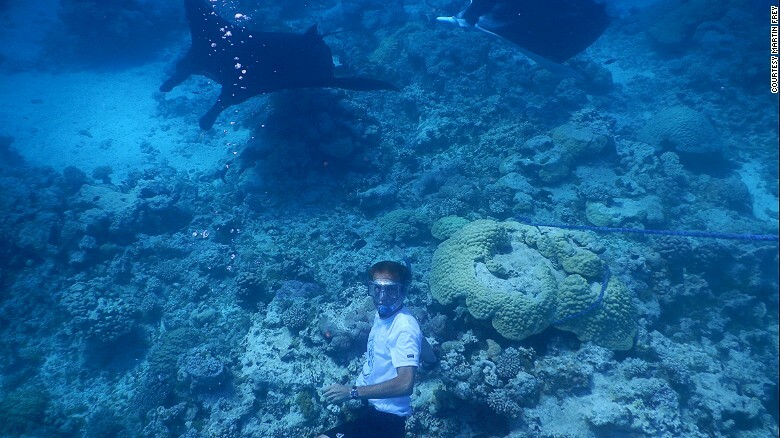 "During my sail, I got to swim with whales and manta rays. It was a dream come true"
When Martin Frey set out to climb Mount Kilimanjaro, he had no inkling it'd be the start of an 11-year mission that would take him across continents, through oceans and potentially win him a place in the Guinness Book of World Records. "I was simply doing a safari thing and thought Kilimanjaro would be a fun challenge," says the 56-year-old from Utah. "It was just an add-on to the trip." 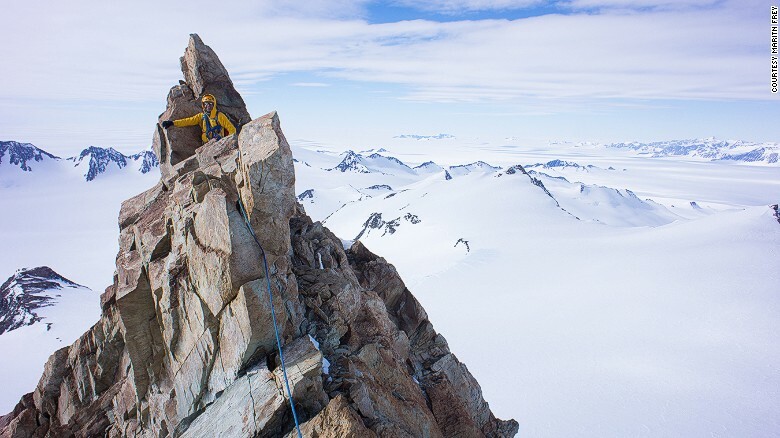 Final ascent : Antarctica's Mount Vinson was the last peak Frey climbed. After conquering his last mountain, Frey sought out an activity that would allow him to include his wife and seven-year-old daughter, Lily. Frey has since made it his mission to sail all seven seas - a task accomplished on April 17. 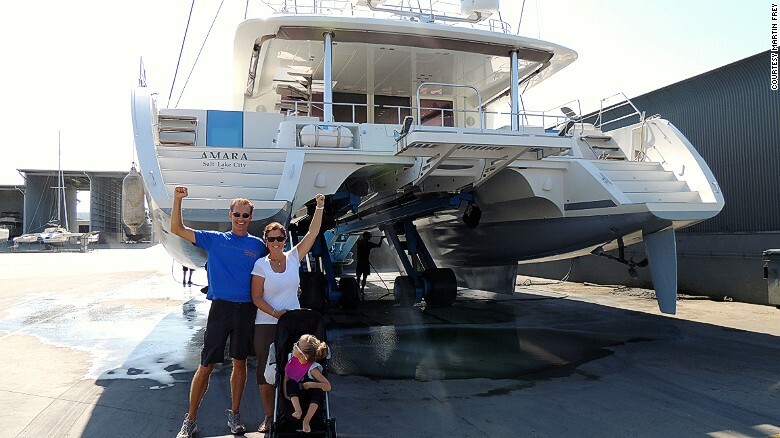 He says he's the first person to have climbed the seven summits and sail the seven seas. Part of what made it easy to keep going was the knowledge that he could always turn back. With his wife, he gave himself permission to do that if his journey ever got dangerous. There have been few challenges Frey hasn't been able to overcome. One trial, however, has proved too formidable to conquer, even for him: seasickness. "It never gets better," he says. "The first three days whenever I leave port are miserable. "I continually battle it whenever I go below deck." "Sometimes we predefine our comfort zone, or put boxes around what we think we're capable of. "I think I have a much stronger inherent sense of what I'm capable of achieving as an individual." the same period that Columbus “discovered” the Americas. This shipwreck is infamous and a whopping five hundred years old. Shipwreck From Explorer Vasco da Gama's Fleet Discovered March 15, 2016 - After 18 years of research, excavations and archaeological analysis, National Geographic grantee David Mearns has successfully discovered one of Vasco da Gama's ships lost at sea in 1503 off the coast of present-day Oman. Together with the Oman Ministry of Heritage and Culture and over 50 crew members they found thousands of artifacts including gold coins, canonballs, ceramics, and a ship's bell that helped them confirm the age and provenance of the ship. Portuguese navigator Vasco da Gama found a sea route to India in 1498, becoming the first European to reach Asia by sea and ushering in an era of Portuguese imperialism. Da Gama secured a monopoly on the valuable spice trade, terrorizing coastal cities and vessels along the way. When Oman's Ministry of Heritage and Culture recently announced the discovery of a 500-year-old shipwreck from the fleet of famed explorer Vasco da Gama, it marked the culmination of an 18-year archaeological search and recovery effort led by self-described "shipwreck hunter" David Mearns of Blue Water Recoveries Ltd.
his uncles Vicente and Brás Sodré were in charge of a five-ship squadron. They had specific instructions to provide military cover for friendly trading states on the west coast of India and to disrupt Arabic shipping along the route, Mearns told Live Science, but they disobeyed their orders and instead went to the Gulf of Aden, where they carried out a campaign of piracy. After sacking and killing everyone on five Arab ships (and keeping much of the loot for themselves), the Sodrébrothers needed to make repairs. 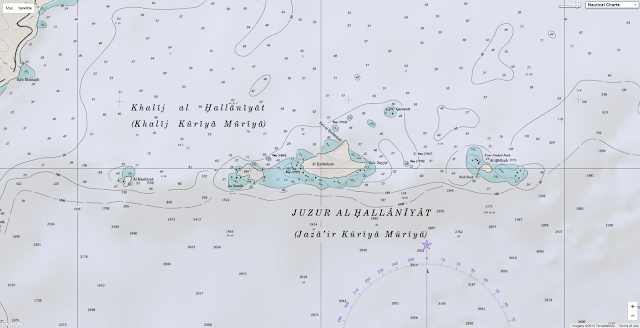 They took shelter in a bay at Al-Hallaniyah, the largest of the Khuriya Muriya Islands, located about 28 miles (45 kilometers) off the southern coast of Oman. "They were friendly with the Arabs [on the island] and trading with them —maybe too friendly with their wives, it seems from the archives," Mearns said. 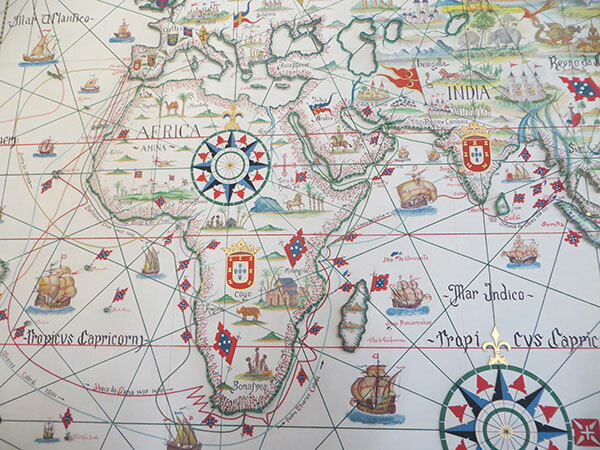 The Portuguese ships were anchored in a bay that was protected on all sides—except the north. When the local fishermen knew there was a strong wind coming from the north, they told the Portuguese sailors to get on the other side of the island. But, believing their iron anchors to be strong enough to withstand the storm, the Sodré brothers didn't heed the warnings. The wind came, and the ships' moorings were torn away. 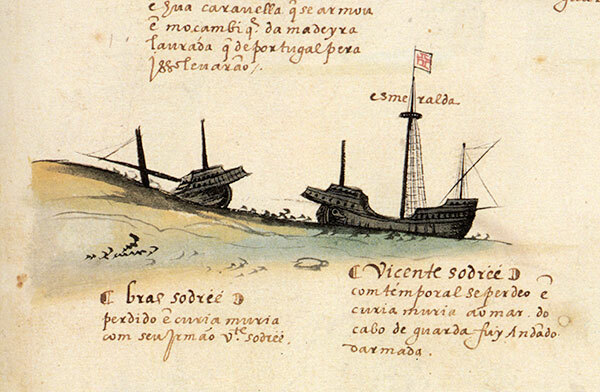 Brás Sodré's ship, nau São Pedro, ran hard aground, but Vicente's ship, nau Esmeralda, sank in deeper water, killing him and everyone else on board. Another captain from the squadron recounted the disaster in great detail in a letter to the Portuguese king, and the story has been retold in many histories. "It was a very rich and well-told story, which is great for archaeology," Mearns said. "You usually don't have that luxury." That story led Mearns to the northeastern coast of Al-Hallaniyah in 1998. During the initial investigation, he said he found more than 20 large stone cannonballs sitting right on the surface of the seabed. Mearns and his Omani partners then conducted more thorough archaeological surveys and excavations in 2013, 2014 and 2015. They found hundreds of artifacts, including copper-alloy barrels, a number of stone shots, gold coins, West African and Asian ceramic pots and stone beads, he said. "Where most archaeologists study wrecks that have already been found, with this one we actually set out to find it," he says, beginning with an eyewitness account of the Esmeralda, the ship of da Gama's uncle, Vincente Sodré, sinking in the waters off of Al Hallaniyah Island in the Arabian Sea. The project team, a partnership between Oman's Ministry of Heritage and Culture and Blue Water Recoveries and supported by the National Geographic Society Expeditions Council, spent three seasons mapping and excavating the wreck site. The remote location and complexity of the shipwreck required a wide array of technology—from magnetometers and differential GPS, to airlifts that work like "underwater vacuums"—and a number of specialists to operate it. To examine some of the shipwrecks' corroded artifacts, the team turned to high-tech methods. They used CT scanning to identify two silver coins: the Manuel índio, minted in 1499; and the real grosso, minted sometime between 1475 and 1479. Portuguese King Dom Manuel I ordered the índio to be struck after the return of da Gama's first voyage to India, specifically to be used in trade with India. As there is only one other known índio in the world (housed at the National Historical Museum of Brazil), this coin has reached legendary status in the coin-collecting world, Mearns and his colleagues wrote. CT scans were also used to get a better look at a bell (which was wrested from under a boulder in shallow water) and found that it was inscribed with the numbers "498." 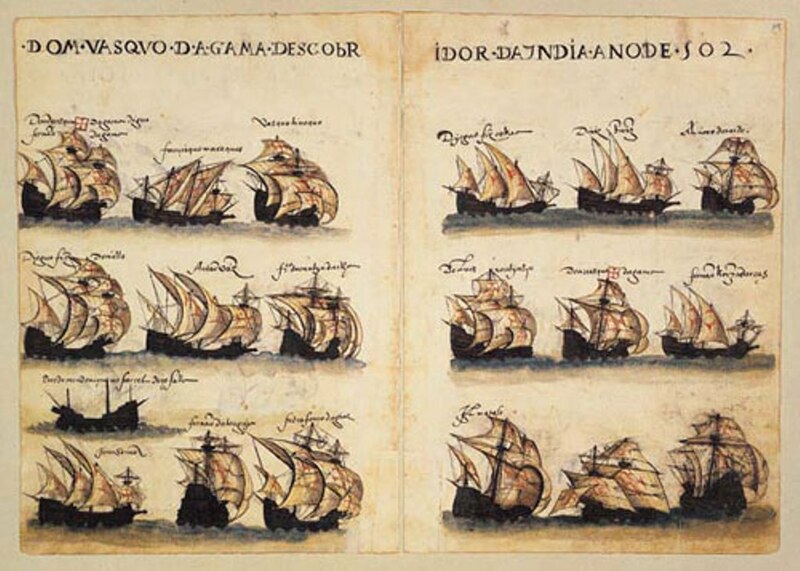 The researchers suspect that perhaps the "1" eroded from the manufacture date of 1498; that would chronologically fit with Sodré's squadron, which left Lisbon in 1502. "It's very possible that that could be the oldest ship's bell ever found in the world," Mearns said. "And it was found less than 100 meters [328 feet] off a shoreline, in a depth of water that you could have snorkeled to. As small as the world is, there are still places left to explore." After recent underwater excavations and careful analysis of more than 2,800 artifacts, including cannonballs and rare coins, the researchers are now fairly certain they have found the nau Esmeralda, the doomed ship commanded by da Gama's uncle. Shown here is a copper alloy disk, marked with the Portuguese royal coat of arms. Take a behind-the-scenes look at what it took to locate and excavate the earliest shipwreck we have from Europe's Golden Age of Exploration. The findings were published online March 14 in the International Journal of Nautical Archaeology. To the naked eye, our oceans look like a huge, endless expanse of water. In actuality, they’re divided into zones and areas, similar to how land is segmented into countries and states. From your country’s shores to the lawless high seas, see how the vast global ocean is made up of smaller zones. Get the facts about the high seas—the two-thirds of our world’s oceans that are not under any country's jurisdiction. This quick whiteboard tutorial explains why these international waters are so important and how the United Nations can help protect high seas marine life and ocean resources.